« Say “nay” to ICUs, we need more Intensive “human care” units ! How effective is Thrombolysis for stent thrombosis ? Stent thrombosis is a dreaded complication as the number of PCIs are increasing in exponential fashion.The key issue is to take care of the stented segment till it gets fully endothleised. We have excellent , time tested dual anti-platelet protocol to take care of this . Still , they are not infallible . 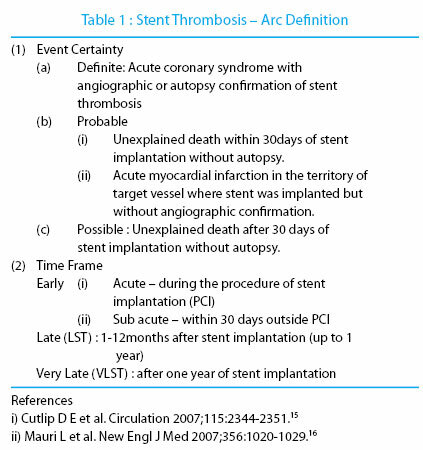 ARC has classified stent thrombosis with reference to the timing of implanting the stent . The funny aspect of this classification is , it hides a fact , whenever a stent concludes suddenly it is acute for that patient and his myocardium . So in a given patient who presents with ACS every stent thrombosis is acute. Of course , chronic thrombotic process can occur in few and present as as CTOs within the stent . Generally stent thrombosis is considered resistant to lysis . This more on our perception than on sound scientific data. Every cardiologist would have experienced at least few cases of acute stent occlusion that had been successfully lysed. Underlying mechanism of acute stent thrombosis. Though , it is risky to rely on lysis alone it is always worth a try . Lysis is easily available and can be instantly administered without a need of special expertise . Few lives can be saved while one ponders over shifting the patient to a bigger center. Pharmaco-invasive approach can be perfect for this situation. Experience suggest , It may be wise , even if cath lab is available on site or in the vicinity , the option of thrombolysis is to be considered first for patients with suspected acute stent thrombosis , if the patient is otherwise stable .